Today for #SundaySupper we are to create a recipe for our end of the year cravings. This was pretty tough because I crave a lot of things, but I finally narrowed it down to something I have been wanting to make and of course eat. 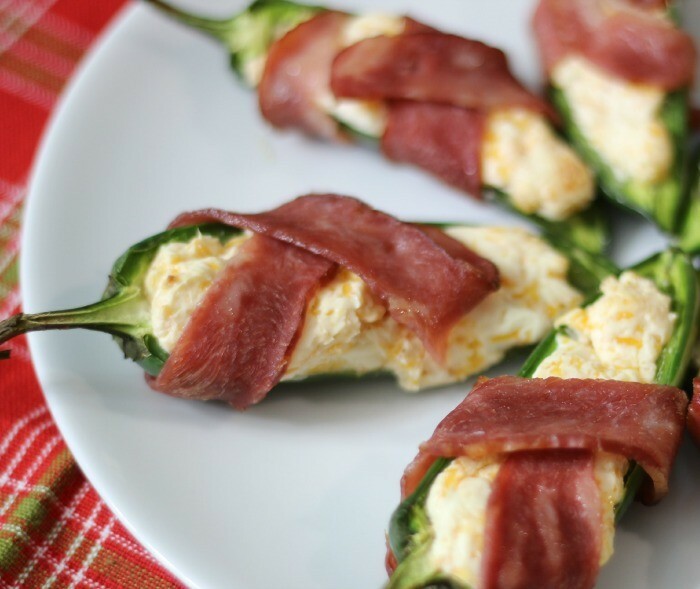 I have for you my Jalapeno Poppers Wrapped in Bacon. Oh Yeah!! Peppers, cheese and bacon, need I say more? This is one delightful appetizer. 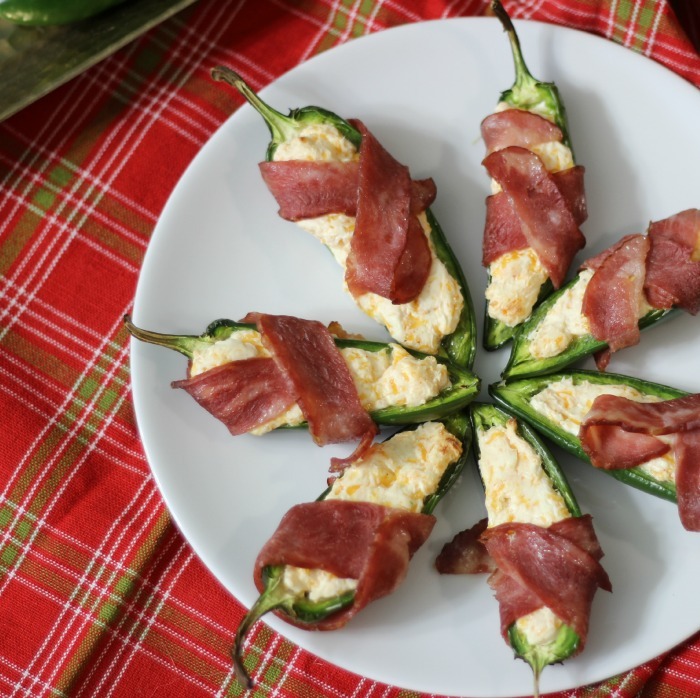 It is a spicy jalapeno, filed with cool cream cheese and cheddar cheese all wrapped in a piece of bacon. It is so good and sure to be a crowd pleaser. Plus, you want to know a secret? They are only 50 calories each. Yes, bacon and cheese together only 50 calories! He he I think I am in love! To make this low in calories, I used reduced fat cream cheese with full fat cheddar cheese. For the bacon, I sliced it down the middle horizontally, so the calories per slice are cut in half. Plus to boot, I used a reduced fat bacon, which was only 20 calories a slice and cut in half, 10 calories! I used Applegate Good Morning Bacon, but you could also use turkey bacon or another reduced fat bacon. Trust me in this combo, no one will know the difference. Not only are these little bites of spicy goodness taste great, but they are so easy to make. I had my Husband slice the jalapenos and de-seed them for me, while I mixed the cheese’s together. Just fill the jalapenos with the cheese mixture and carefully wrap the bacon around it. I used a toothpick to hold the bacon in place. Just remove the toothpick before serving. I baked my poppers in the oven for 15 minutes. Perfect! 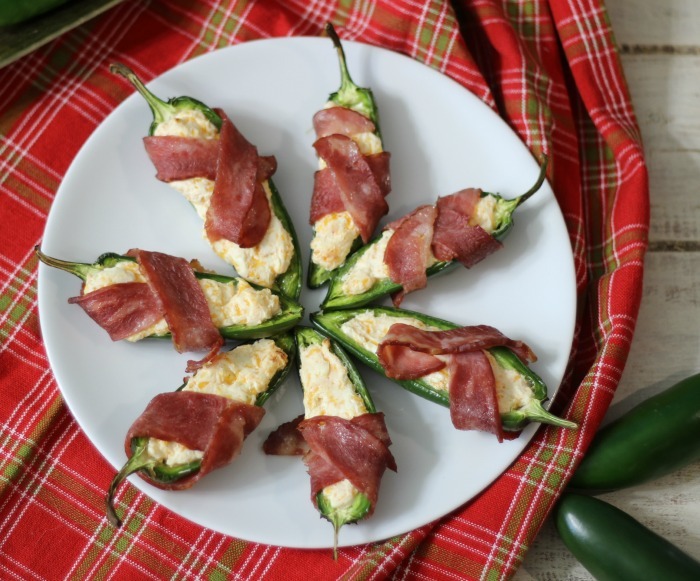 Fresh, spicy jalapenos filled with a garlic cream cheese mixture and wrapped in reduced fat bacon. Only 50 calories a serving. In a medium bowl, add cream cheese, cheddar cheese and garlic. Evenly fill each jalapeno with cream cheese mixture. Wrap bacon around the jalapeno and use a toothpick to hold it in place. Bake in oven for 12-15 minutes or until bacon is fully cooked and slightly crisped. Please wear gloves when cutting the jalapenos and do not touch your face. Wash your hands immediately with soap and water. I used reduced fat bacon in this recipe. Any bacon of your choice will work well. This is one delish appetizer, but it also tastes good for breakfast. Yes, I had these for breakfast and they were mighty good! So cute, Jennifer! Perfect party food! Oh yum! I could eat a whole plate of these. Bring on the jalapenos!!! I love a spicy treat like these – so good! 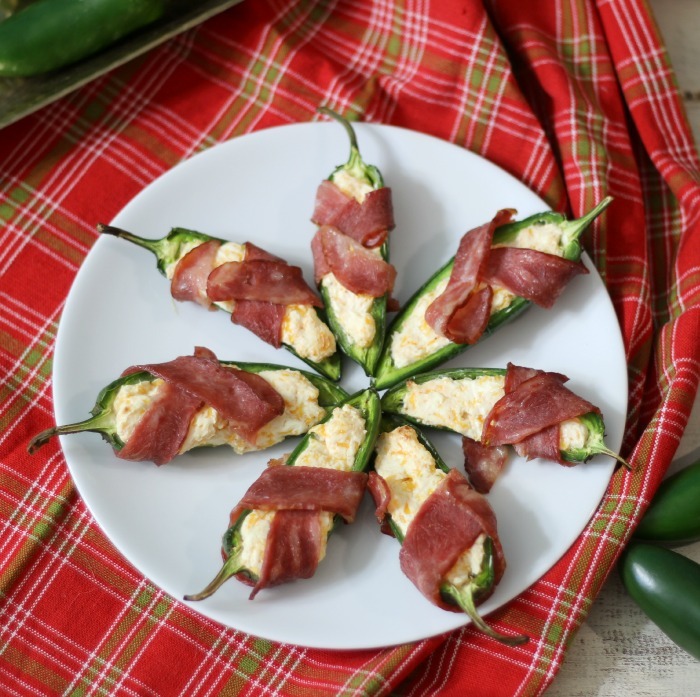 Jalapeno poppers are one of my husband’s favorite apps….but I have NEVER made them! LOL Your version looks way prettier than the ones we usually have at parties. I might just have to make these for him soon and surprise him! Happy New year! You should try making them. They are so easy and delish! What a totally fun app! I know this would be a huge NYE hit. So festive and holiday worthy! Definitely craving worthy! Only 50 calories per popper??!! Sold!! I’m so glad you shared that – I thought for sure they’d be a big splurge to have, and they look so, so, good!!!! These look amazing. Looking forward to trying this deliciousness on NYE. These would be a great little snack to make for NYE!! Bites of goodness! Happy New Year Jennifer! Thank you! I am so happy they are low calorie! You had me at bacon, Jen. These look dynamite. 2 of my favorite things! Yum! 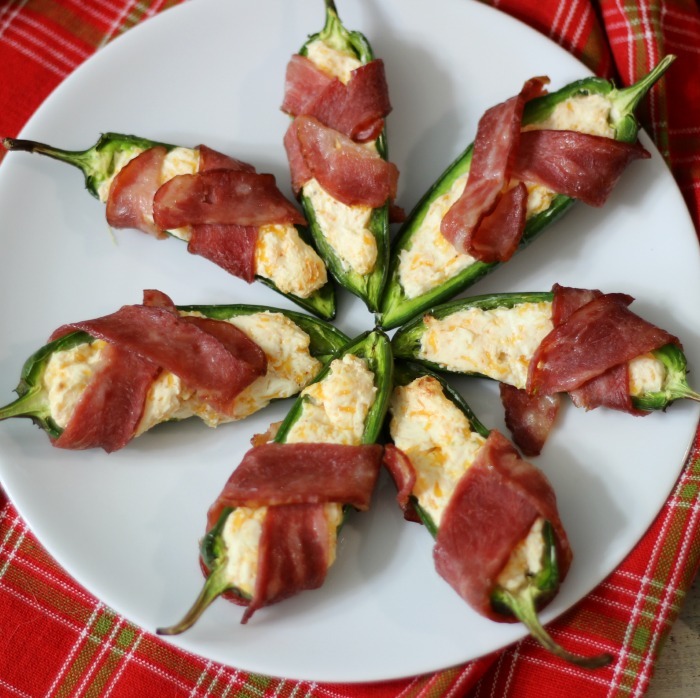 I love the idea of using bacon for the jalapeno poppers! Perfect New Year’s Eve snack! Spicy goodness in a handheld package! I love it!